The Finnish aviation museum is one of the most visited museums in Finland. 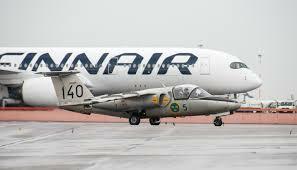 Finlands aviation museum is located in Vantaa near Helsinki- Vantaa airport. It was opened in 1972. It moved to a new location in 1980. They have 80 different airplanes, about 9000 objects, 16 500 books and 130 000 dias and pictures. There are warplanes, passenger planes and many others. The aviation museum is a great place for the whole family both for experienced and beginners. The museum has 4 flight simulators that give a realistic view of flying. Simulators can be used on guided tours in the museum. The primary exhibition is divided into two halls and it has 70 planes and a lot of equipment from many different centuries. In the third hall is the special exhibition space. The aviation museum gives a great view of the history of flying and it is definitely worth a visit. The tickets cost 10 euros for adults and 7 euros for children under 17 years. Tickets for children under 7 years are free. There is also a possibility to get a family ticket for two adults and two children that costs 25 euros. The museum is open 10-20 on mon-fri and 10-17 on Saturday and Sunday. It is closed on some special days for example Christmas.